If you are experiencing feeding issues with the X Form Magazine, the Anti-Tilt follower should solve this issue. Note: Regular BHO followers will work in 10 & 15rd magazines, they do not seem to have a feeding problem. All BDM magazines may eventually have this new follower in them, we might modify the mold to avoid new change-over costs between the old and new style follower. The follower might be red or black. Both followers will still hold the bolt open on the last shot. The permanent color will be black- this will help everyone know if they have the new anti-tilt follower or the older follower. The red is used on this new follower because we are expediting our molding process to get these followers out to customers, red is used when we are out of black material. No difference in performance between the two colors. 1. Bottom of the magazine: Using a pointed tool (a pen will work) to poke the keeper, keep a finger over the stopper so the spring doesn’t fly out of the mag body. Take the follower parts and spring out of the magazine. 2. 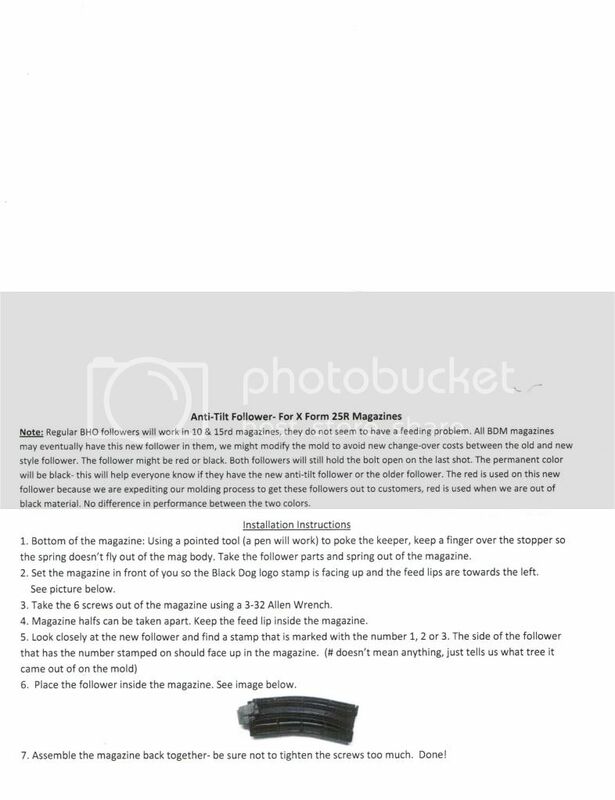 Set the magazine in front of you so the Black Dog logo stamp is facing up and the feed lips are towards the left. 3. Take the 6 screws out of the magazine using a 3-32 Allen Wrench. 4. Magazine halfs can be taken apart. Keep the feed lip inside the magazine. 6. Place the follower inside the magazine. See image below. 7. Assemble the magazine back together- be sure not to tighten the screws too much. Done!